Wakes up early in the morning, opens the door, the entire house is quiet, takes a deep breath, set my gaze upon the magnificent urban view, thank God for the wonderful morning, and start off my day. After a hectic morning of roughly cleaning the dirty bathroom, finally, I sat down with a half-exhausted body, switched on laptop, brew myself a cup of horlicks and enjoyed my simple breakfast, bread + butter while reading all those statuses in fb. So, today I'm just gonna scribble something short coz I'm not going to scramble everything that I've encountered within these few months into one post. Reading back all my recorded memories just made me realize that how far I've gone through. I've been through the darkest alley, and the pinnacle of the mountain. I've met uncooperative group members, but also a bunch of encouraging friends. I've encountered some issues, but also solved them in the end, with the help of God's angels of course. There's so many things I wanted to write but just kept stored in my mind. It's either I'm too busy or didn't have the right mood. 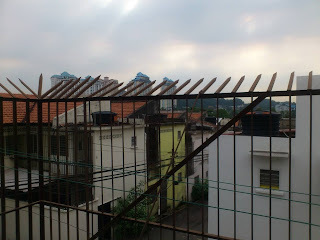 Reading thru one of my acquaintance's blog from Penang had act as a mood catalyst for me to write this post. There's one more week till final, and the more it gets nearer to sem break, the more I am in holiday mood. Oh, what conflicting emotions!